Dates of birth and death unknown. 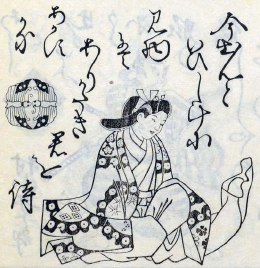 Disciple of Tamagawa Sennojô I, he performed as a wakaonnagata in Edo from 1677. He performed at the Ichimuraza in 1687 and was recorded in 1693 in the illustrated book "Kokon Shibai Irokurabe Hyakunin Isshu". No record afterwards. Dates of birth and death unknown. Disciple of Tamagawa Sennojô III, he received the name of Tamagawa Kindayû and appeared on stage for the first time in Kyôto in the 1st lunar month of 1713. He became wakashugata in the 11th lunar month of 1715 in Kyôto, performing in the kaomise drama "Chiyogasane Kiku no Shinpai", which was produced by Yamatoyama Jinzaemon I. Then, he became wakaonnagata in the 11th lunar month of 1716 in Kyôto, performing in the kaomise drama "Tatsu no Miyako Ikuyo no Yonedawara", which was also produced by Yamatoyama Jinzaemon I. He played in the 1st lunar month of 1720 in Kyôto the role of Rokurôzaemon's wife in the new year drama "Keisei Kaname no Ishi". 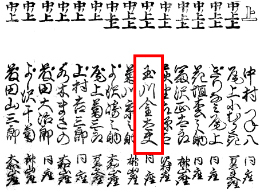 His rank in the 1720 Kyôto hyôbanki, wakaonnagata section, was (shiro)jô (white superior) [visual]. No record afterwards. He had the reputation to be a heavy drinker.